Putting another financial corruption case behind us, former McKinsey exec Anil Kumar has agreed to pay a $2.8 million settlement to the SEC. 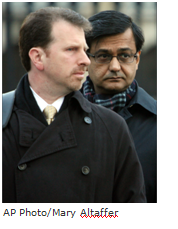 Kumar, a cooperating witness in the insider trading probe of Galleon Group, pleaded to criminal conspiracy and securities fraud charges, and has also agreed to cooperate in a separate criminal investigation of Galleon founder Raj Rajaratnam. Is Ernst & Young an ideal employer? The 60,000 college students who participated in the 2010 US Undergraduate Universum IDEAL Employer Survey seem to think that it might come close to one. For the third year in a row, EY was ranked among the top five overall employers, and No. 2 in the business category. CGI has won a hefty contract from the Centers for Medicare & Medicaid Services. Under the five-year deal, the firm will modernize, and conduct application management and maintenance, on three external websites that service millions of beneficiaries and health care providers. CGI has had a bang-up month, also having acquired Arlington-based IT contractor Stanley Inc. for $903 million. PwC has its sights set on Middle East expansion, having announced plans to double its fee income from the region to $500 million in the next two years. Where will this outpouring of funds come from? The firm is banking on increased spending on infrastructure projects by Arab governments, which will call on the services of foreign advisory firms. Are PwC and KPMG moving into the credit rating business? As the three largest credit rating agencies continue to take heat for not helping to prevent the financial crisis, big accounting firms may step in to help assess a business' risks. KPMG and PwC to take on credit rating?